Ohio Marijuana Dispensary Bond • Surety One, Inc. Yes, medical marijuana has been approved. Yes, licenses are availble, and yes, an applicant must file an Ohio marijuana dispensary bond in order to obtain a license to operate. Pursuant to Ohio Code, the State Board of Pharmacy is permitted to issue up to sixty provisional licenses. That rule expires on September 8th, 2018, at which time the Board will review the population of the state, the number of patients seeking to use medical marijuana and the geographic distribution of dispensaries in order to ensure patient access to medical marijuana. The Board may increase or decrease the number of licenses accordingly. 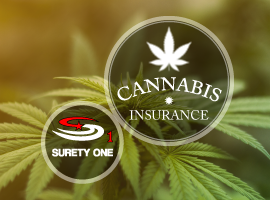 Ohio surety bond leader, SuretyOne.com is the most responsive underwriter of marijuana business license bonds and the insurance coverages needed by the sector. We firmly believe in supporting the availability of cannabis products to patients that enjoy a better quality of life from them. We will consider applications for dispensaries and grow operations in all states where current legislation favors legal marijuana businesses. For further information about an Ohio marijuana dispensary bond contact us at (800) 373-2804, email Underwriting@SuretyOne.com or chat with us live here.